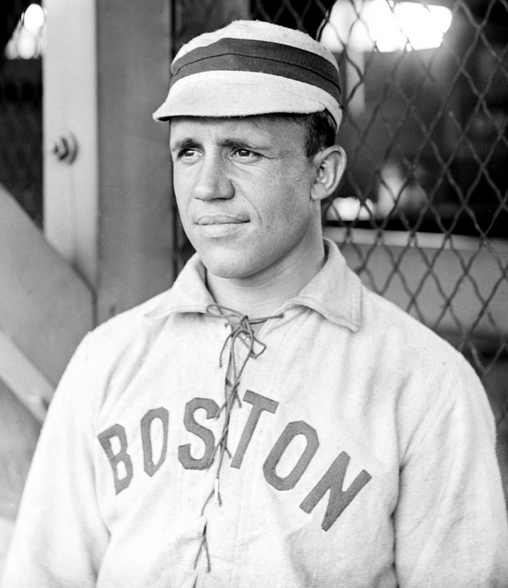 Sparkplug shortstop Freddy Parent, the “Flying Frenchman,” led the Boston Americans with MVP-type seasons to the first modern World Series championship in 1903 and the American League pennant in 1904. An early American League star, Parent (along with teammate Buck Freeman) was its first ironman, playing in 413 consecutive games from the April 26, 1901, opener to September 25, 1903, surprising considering his aggressive playing style. Beset by injuries, including multiple beanings that hampered his play later in his career, Parent nevertheless ranked among the all-time American League leaders in several categories after its first decade, including second in games played and at-bats, fourth in hits and sacrifice hits, and sixth in total bases. Alfred L. Parent was born on November 25, 1875, in Biddeford, a predominantly textile community in southern Maine. He was the oldest of ten children of Alfred, a fireman, and Celina (Paul) Parent, both French-Canadian immigrants. Freddy quit school at the age of 14 to labor in Biddeford’s Laconia Mill harness shop for 65 cents a day. When not working, he enjoyed playing scrub ball on the city’s back lots, captain of a team he helped organize. When he was 16 Parent moved to Sanford, Maine, where he worked in the Goodall Worsted Company’s weave room and played amateur ball. Parent married the former Fidelia LaFlamme in 1896 and they had one child, Fred Jr. His “proposal” to the 16 year-old Fidelia included a conditional baseball provision: “I want to marry you, but I do not want to work in the mill. Okay?” The young Fidelia, aware of his baseball desire and potential, replied “yes.” Thus began a 67-year relationship. The 5-foot-5, 148-pound (some sources say 5-foot-7) Parent’s introduction to league play was a secondary role on the Sanford town team. “Everybody pretty nearly told me I was too small to play baseball and that I would never make a player anyhow.” Once given the opportunity to start at shortstop for the town’s first team, he developed into a strong infielder. Parent stretched his playing time by playing on teams in Maine and New Hampshire over the next two years. Parent’s first professional season came in 1898 with New Haven in the Connecticut League. Boasting one of the league’s top batting averages at .326, he helped New Haven to a second-place finish. In July 1899 the shorthanded St. Louis Perfectos of the National League recruited him from New Haven while they played the New York Giants. The Brooklyn Superbas had expressed an interest in Parent to replace the injured Hughie Jennings, and maintained the initial rights to him after paying New Haven $1,000 for his release. But the team changed its plans, and the Perfectos got Parent on a trial basis for the same offer. Parent started at second base for two games, contributing to a Perfectos victory in the first game and getting two hits overall. But he suffered a sprained ankle and the Perfectos subsequently released him, stating that he needed more experience in the minors. Parent returned to New Haven and helped the team win the 1899 Connecticut League championship. He finished second in the league in batting (.349) and third in runs scored (76). In 1900 Parent played shortstop for the champion Providence Grays in the more advanced Eastern League, batting .287 with 23 stolen bases, 21 doubles, six triples, and four home runs. In March 1901, Parent signed with the Boston Americans, where the sturdy little shortstop’s solid hitting, fielding, base stealing, and hustle endeared him to the Boston fans. A right-handed batter, Parent was a dependable hitter. He was a wrist hitter, slapping balls to all fields. He hovered over the plate with an exaggerated piece of lumber, a wagon-tongue bat of suspicious weight. Known as an excellent bunter, Parent also showed some power. In 1901 he augmented a .306 batting average with 36 extra-base hits. The following year his average dipped to .275, but he also cranked a career-best 31 doubles. Crowding the plate enhanced his bunting and opposite-field hitting, but it also exposed him to being hit by pitches. He ranked sixth in the American League in times hit by pitch in the league’s first decade, including multiple blows to the head. With second baseman Hobe Ferris and first baseman Candy LaChance, Parent was part of the early Boston Americans’ dynamic double-play combination. Like the famous National League keystone duo of Johnny Evers and Joe Tinker, Parent and Ferris went years without speaking to each other. While they demonstrated spontaneous and effective teamwork on the field, off-field their association was one of unspoken enmity. Fortunately, the proud and quiet Parent and the hotheaded Ferris’s baseball instincts outweighed their lack of verbal discourse, and this translated into defensive brilliance. Parent enjoyed his best seasons as a professional in 1903 and 1904, when Boston won back-to-back American League pennants. In 1903 he posted a .304 batting average, and registered career highs in triples (17, tied for fourth best in the league) and RBIs (80, eighth best in the circuit). In the first modern World Series, in 1903, Parent outshined the legendary Honus Wagner of the Pittsburgh Pirates, outplaying him in the field and notching a batting average nearly 60 points greater than Wagner’s for the Series. A “two-way standout Parent made several sparkling plays – cutting off a half-dozen hits with great plays,” and ended the eight-game series with 28 assists. He established a record for most runs scored with eight (broken by Babe Ruth 25 years later). The newborn American Leaguers, considered “soft touches” for the senior circuit stars, came back from a three-to-one deficit to win the best-of-nine series. The next year Parent again enjoyed an outstanding season, batting .291 with 85 runs scored and six home runs, tied for fourth best in the league. But he was simply a passive observer in his most famous at-bat of the season, when 41-game-winner Jack Chesbro of the New York Highlanders unleashed a wild pitch in the ninth inning on the last day of the season to bring in the run that won the pennant for the Americans. Forgotten to most, Parent followed this most famous wild pitch with a base hit that would have scored the run anyway. His hitting effectiveness declined considerably after the 1904 season, however, as he batted just .234 and .235 in 1905 and 1906, respectively. Parent’s average rebounded to .276 in 1907, despite two beanings that year that caused him to become an early proponent of the batting helmet. During the season he began sporting a pneumatic head protector. “Those two blows which felled me had an effect of making me timid whenever I faced the pitcher, and instead of stepping into the ball I was pulling away, the result being that I did not hit up to my standard,” he said. He claimed he would wear the protective gear for the rest of his career. However, while the “bombproof” headgear provided him security and reassurance, it spurred hazing and timorous, chickenhearted jousting. In the spring of 1908, Parent claimed he was no longer shy at the plate and discarded the headgear. Parent struggled mightily at the plate during the next three seasons, posting batting averages of .207, .261, and .178 from 1908 to 1910. In 1911 he staged his final battle with major-league ownership. Coming off a strong spring training, Parent tangled with Chicago owner Charles Comiskey over his pay. After playing in three games for the White Sox, Parent was sold to the Baltimore Orioles of the International League. His tenure with the Orioles gave him opportunities to extend his playing career, gain coaching experience, and influence his former team’s purchase of the greatest player ever. The Orioles, despite their star-studded lineup, faced stiff competition from the nearby Baltimore Terrapins of the newly formed Federal League. The day after his team played to an attendance low of just 17 fans, the financially stricken Dunn began a fire sale. In July 1914 he visited Red Sox owner Joe Lannin and player-manager Bill “Rough” Carrigan in Washington. Dunn took Parent along as a reference whom Carrigan would trust. Carrigan said he sought Parent’s advice “as one of the Orioles master-minds at the time and I figured he could give me the dope.” Parent told Carrigan that while Ruth lacked finish, “he can’t miss with a little more experience.” Carrigan concurred with Parent’s advice, with Lannin and Dunn closing the deal. Parent never lost his enthusiasm for baseball. After Baltimore, he played a short stint with Toronto of the International League. He was a player-manager for the Springfield, Massachusetts, Eastern League team in 1918 and Lewiston, Maine, in the New England League in 1919. From 1922 to 1924 Parent was a successful head coach at Colby College in Waterville, Maine, and later assisted former teammate Fred Mitchell as junior-varsity coach at Harvard from 1926 to 1928. In 1936 Parent was presented a Lifetime Pass by the American and National Leagues in appreciation of long and meritorious service to the game. In 1969 he was elected to the Maine Baseball Hall of Fame. An avid outdoorsman who loved to hunt and fish, Parent spent the rest of his life in his home state. After professional ball, Parent dabbled in a few ventures, including owning and operating a boarding home and running a gasoline station for a number of years. Along with former teammate Harry Lord, he once tried to purchase a minor-league team in Portland. He also unsuccessfully ran for county sheriff. Freddy Parent died on November 2, 1972, three weeks shy of his 97th birthday, in Sanford, Maine. He was buried in Saint Ignatius Cemetery, in Sanford. An updated version of this biography appeared "New Century, New Team: The 1901 Boston Americans," edited by Bill Nowlin (SABR, 2013). The biography originally appeared in "Deadball Stars of the American League" (Potomac Books, 2006), edited by David Jones. Anderson, Will. Was Baseball Really Invented in Maine? (Portland, Maine: Will Anderson Publisher, 1992). Boyle, Frederick R. Later Families of Sanford-Springvale Maine. (Peter E. Randal, 1995). Davids, L. Robert. Baseball Briefs, April 1971. Evers, Johnny and Hugh S. Fullerton. Touching Second. (Chicago: The Reilly & Britton Co., 1910). Fullerton, Hugh S. “Between Games,” The American Magazine, 1911. Keene, Kerry, et al. The Babe in Red Stockings. (Urbana, Illinois: Sagamore Publishing, 1997). Lieb, Frederick G. The Boston Red Sox. (New York: G.P. Putman’s Sons, 1947). MacWilliams, Don. Yours in Sports. (Monmouth, Maine: Monmouth Press, 1969). McGraw, John J. My Thirty Years in Baseball. (Lincoln: University of Nebraska Press, 1995). Niss, Bob. Faces of Maine. (Portland: Guy Gannett Publishing Company, 1981). Reisler, Jim. Before They Were the Bombers. (Jefferson, North Carolina: McFarland, 2002). Ritter, Lawrence S. The Glory of Their Times. (New York: William Morrow, 1985). Smelser, Marshall. The Life That Ruth Built. (Lincoln: University of Nebraska Press, 1975). Armand Chabot, Paul Demers, Therese Desrochers, Glenn Ledoux.